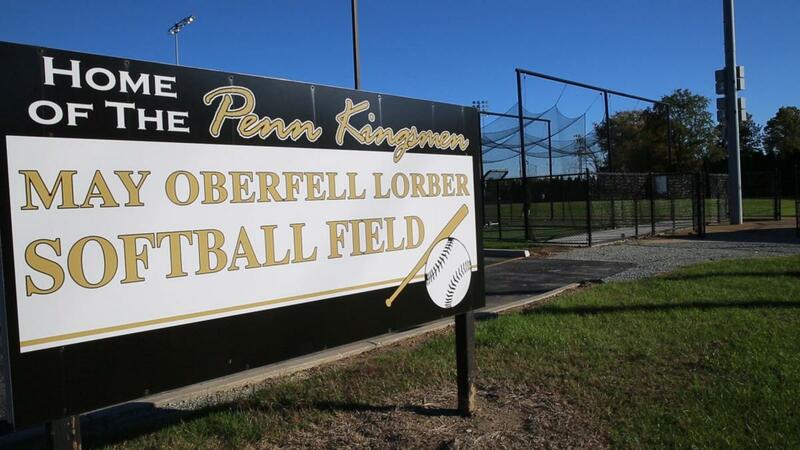 The Penn High School Softball Field is sponsored by May Oberfell Lorber Law Firm. The complex is located north of Penn High School and the Educational Services Center off of Bitterweet Rd., and just south of U.S. 20. It has a limestone and grass surface that was renovated in 2015. There is an estimated seating capacity of more than 500. The visitor and home-team sides feature bleachers on each the visitor and home team's side. There is also open fencing along the backstop to allow people to bring lawn chairs and get a view from behind the plate. Additional seating can be brought in for special tournament events. The fences are 215 feet from home plate to right field and also 215 feet to left field, and 220 feet to center field. The field has full lighting for night games, and has hosted IHSAA sectional and regional events. The softball field also has enclosed concrete dugouts on the first-base and third-base sides, as well as batting cages for home and visiting teams. There is also a junior varsity field located adjacent to the the varsity field. The permanent press box facility also has a concession stand and restroom facilities. All Penn student-athletes have access to the Lifetime Fitness Center.